Every once in a while, I like to create a card with a cute feel to it, especially when I can build a scene with adorable little critters. 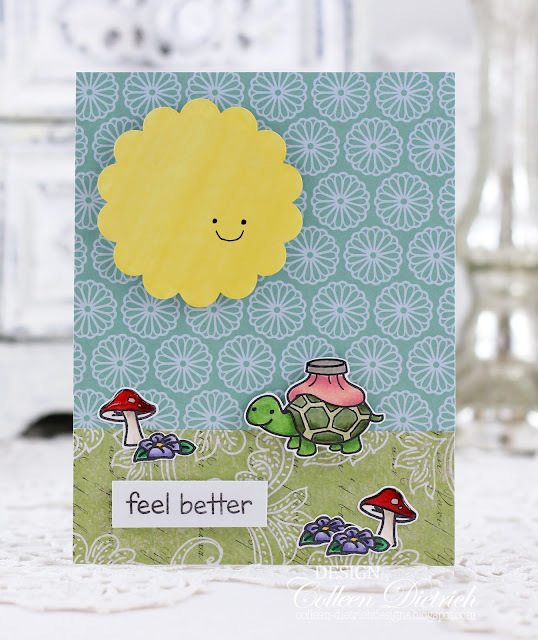 This turtle from Lawn Fawn's 'On The Mend' is wearing a hot water bottle on his back, and he seems happy about it! 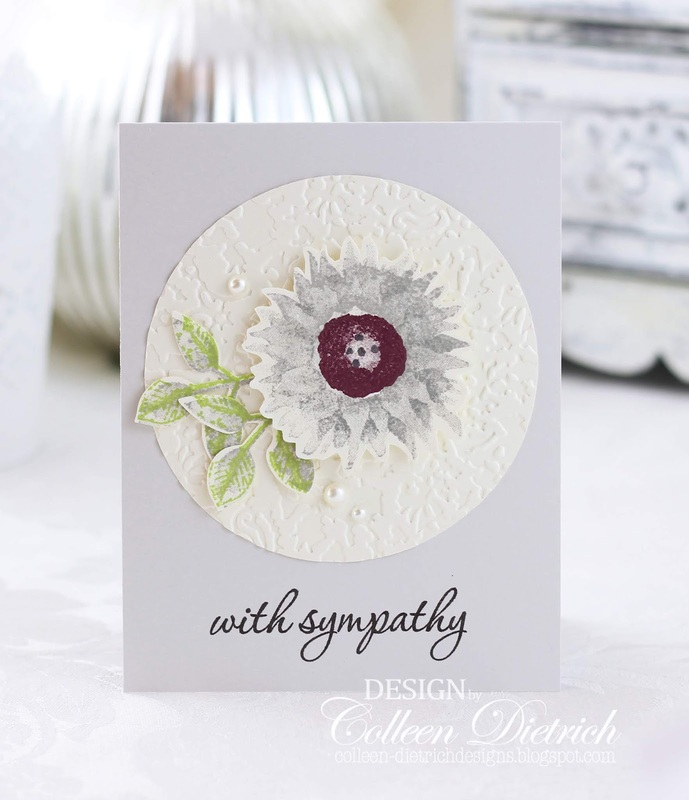 The sun is a scalloped circle die cut that was white. I used a yellow Copic marker all over it, and drew on a tiny face. 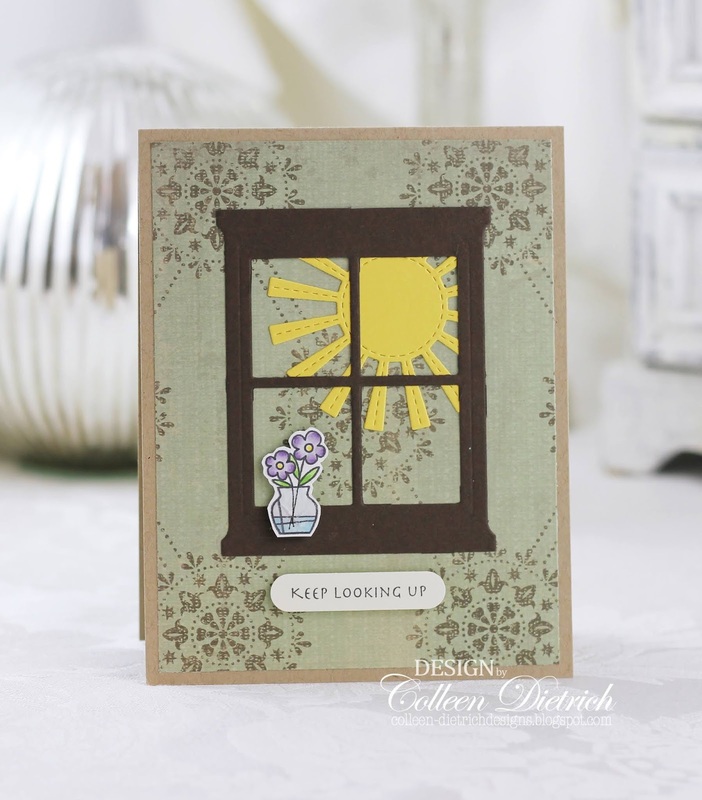 I used patterned papers from a Ki pad, I believe, to stand in for grass and sky. 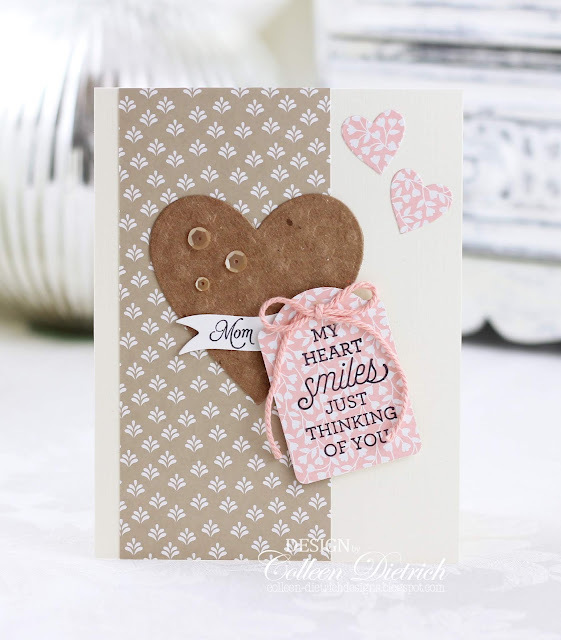 With the first card, believe it or not, I began with a messy square of 'trial and error' kraft cardstock that I could not bear to throw away. (I had used white spray ink through a sieve; not really loving it) The black butterflies pick up the black text from the Stampin' Up! encyclopedia page patterned paper, and of course the sentiment. Supply lists are in each caption. 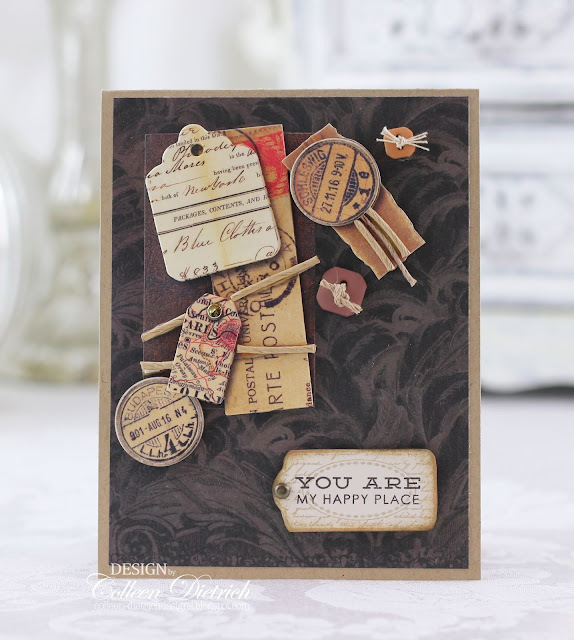 Ages ago, when I was on the Play Date Cafe challenge design team, we featured a rubber stamp company one week called Stampotique. 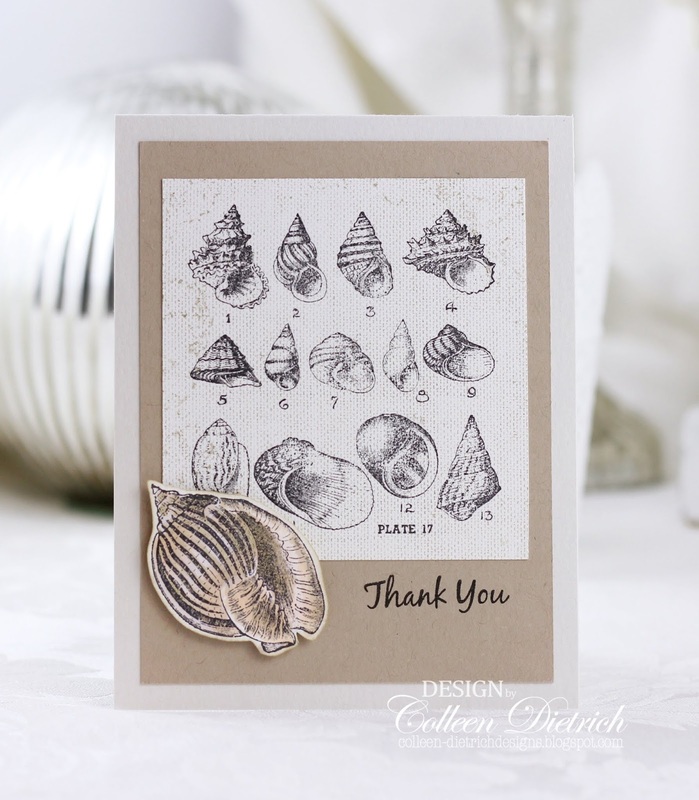 The design team members of PDC got to choose products from Stampotique's website to work with, and I chose one called 'Hutching's'. I presume that the stamp's wording was originally an advertisement in a newspaper. I love it. 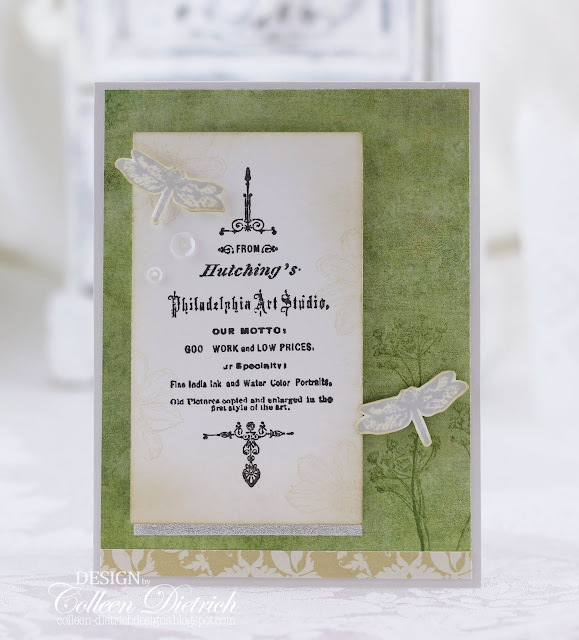 However, it's a little bit of a challenge to fit it into my cards, so I decided to pair it with bits of nature: two dragonflies, and some baby's breath flowers stamped subtly in the background (in green). There's also a tiny sliver of silver glittered cardstock under the advertisement. Just because. Long before I began to use an app called Evernote to organize all of my stamping supplies (with pictures and titles, tags and more), I used to photograph each stamp set and put it in a binder with clear plastic sleeves. Once I abandoned that way of organizing, I had all these papers with photos of stamp sets printed on them. Didn't want to throw them away if they were salvageable, and saved what I could. The one below is an example. 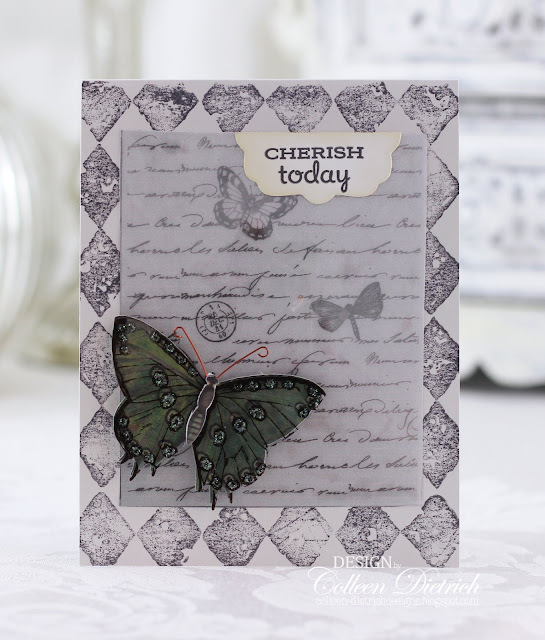 The center panel is a miniature version of Hero Arts 'Antique Background' (with script and butterflies), which I cut from the photo page. 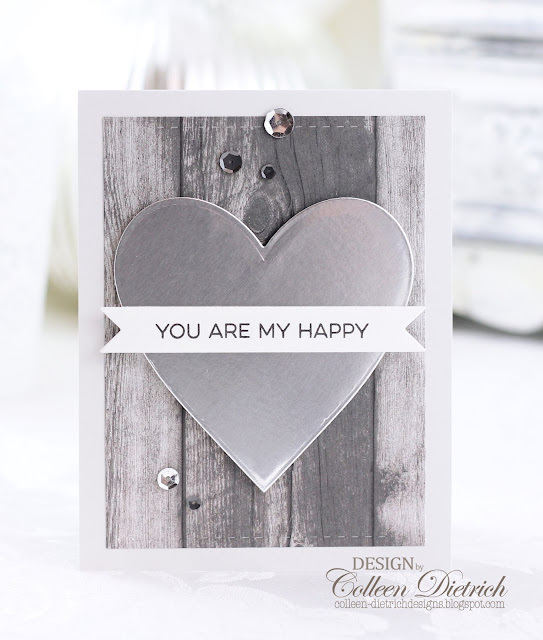 I mounted it onto a gray card base that was stamped with Stampin' Up! 's 'Print Pattern'. The sentiment was lying as-is in a scrap box on my desk, and then I just grabbed a butterfly sticker to tie it all together. 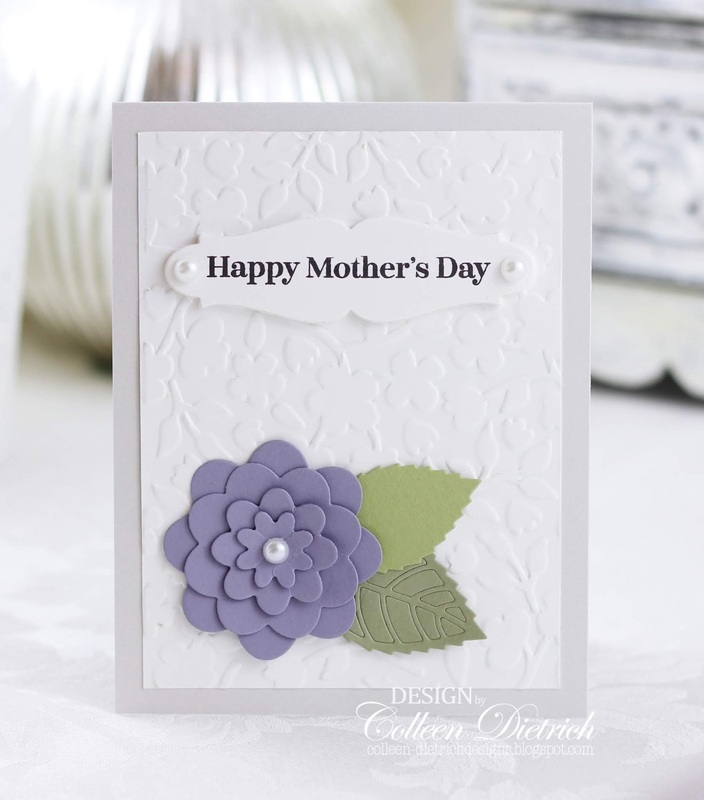 The last card was super easy, because it used digital print-outs that were a gift from my aunt (thank you, Aunt Leanna!). 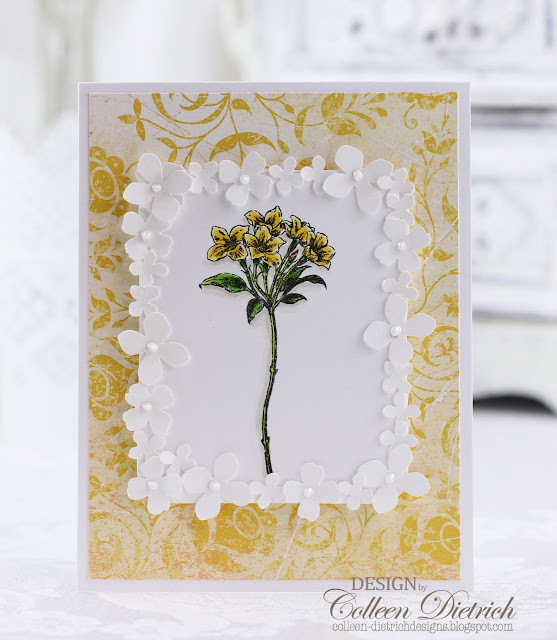 I just added some white rick-rack trim, yellow rhinestones, and a little bee that I stamped and trimmed. Hello! 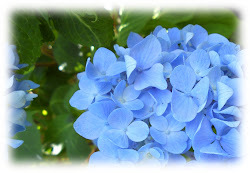 My absolute favorite flower is a hydrangea, especially blue varieties. 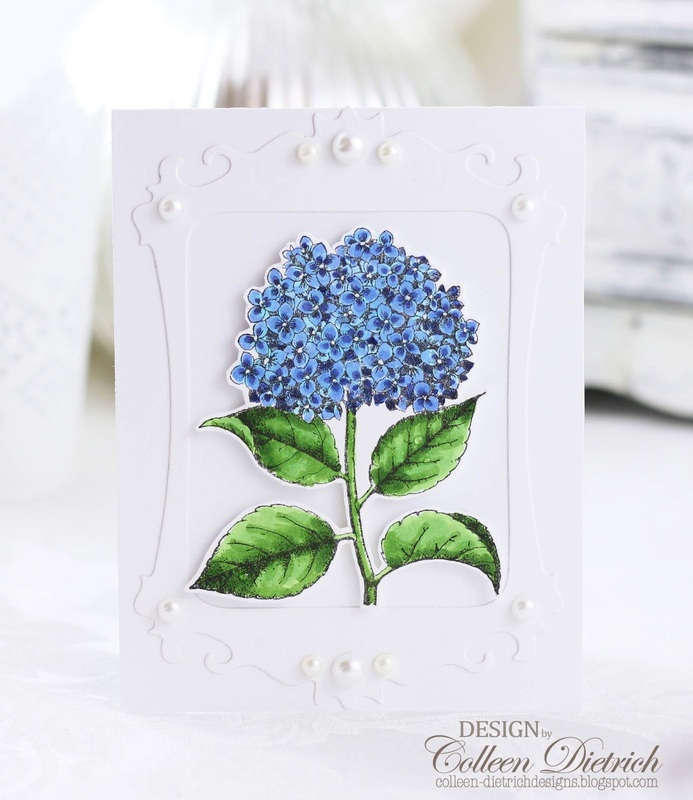 I used the Hero Arts 'Hydrangea' stamp and plenty of blue Copic markers to create the first card you see. I hand trimmed the flower, added dimensional tape behind it, and framed it in white. 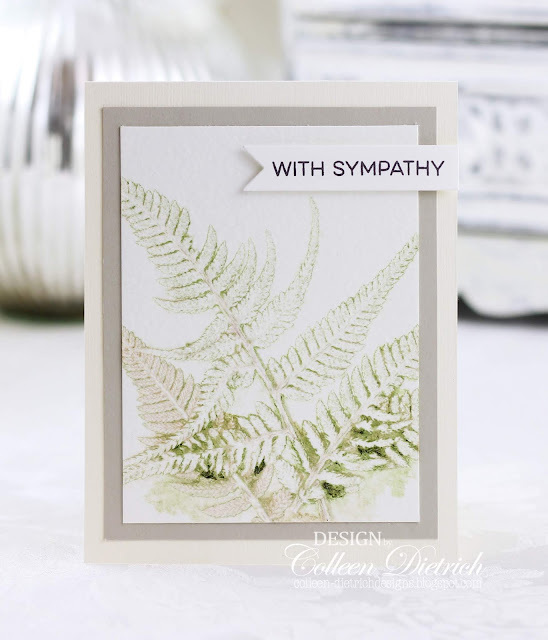 The next two cards are sympathies...both featuring botanicals. 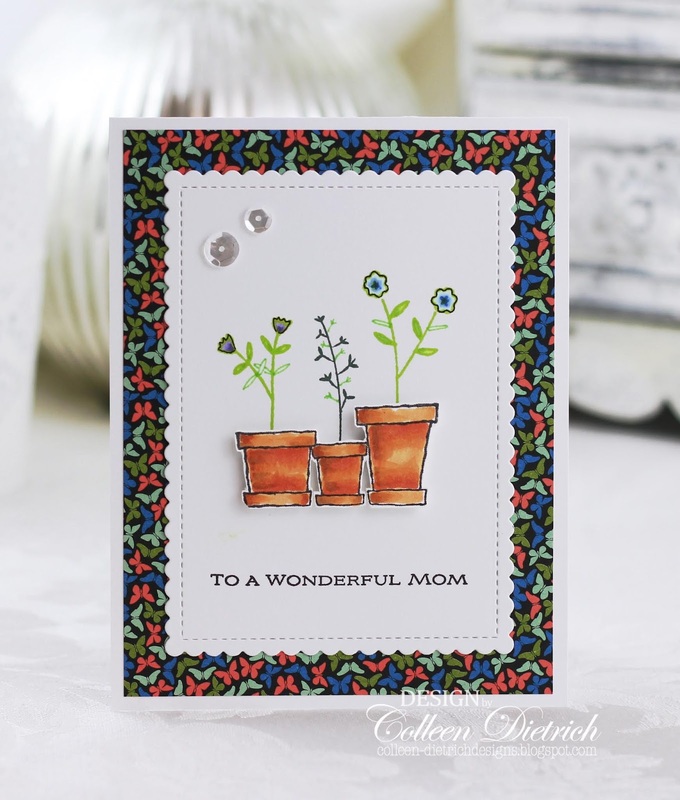 Hollyhocks on one (Stampendous) and ferns on the second. 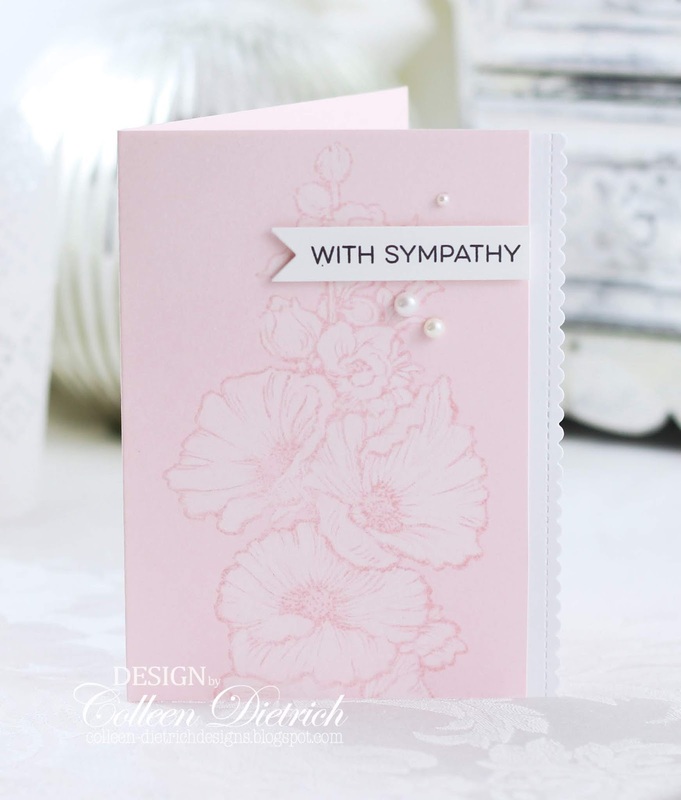 They're simple, and clean, and both use the same sentiment from My Favorite Things 'Essential Sentiments'. A fairly clean and simple post today! Thanks for coming by, and God bless you! 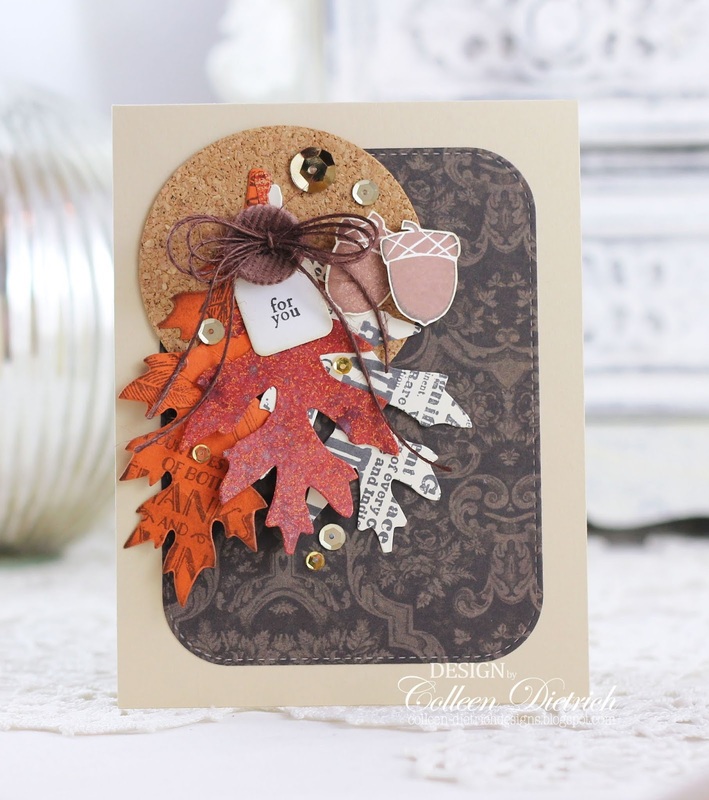 Collage cards are among my favorites to make. I appreciate the challenge of taking elements that look good together and grouping them to create a lot of visual interest. I actually do the same thing to the walls in my home, using different items together to create a cohesive look. 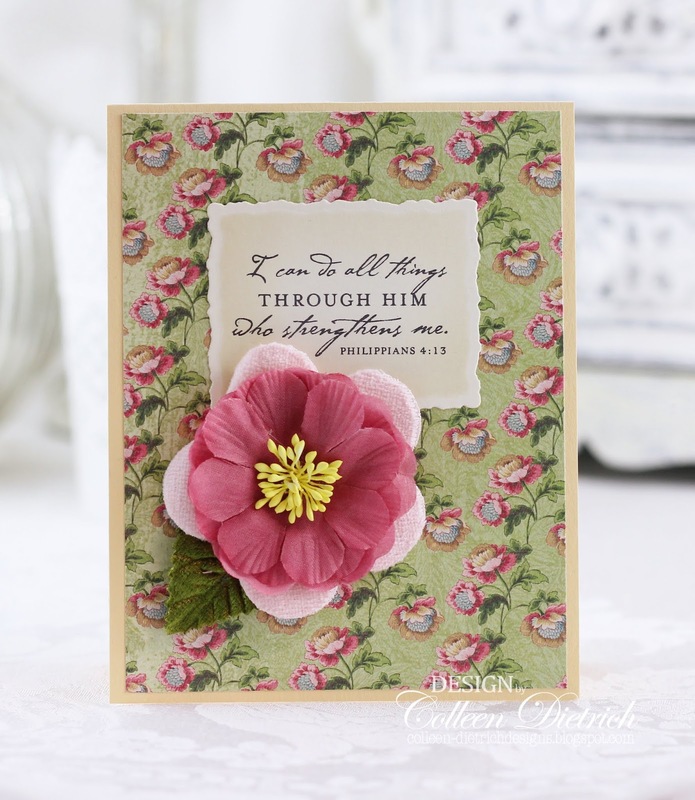 The cards featured in this post also happen to have a masculine feel to them. I used earth tones on every single one. I let the stickers and die cuts influence the color palette. Many of these stickers are years-old, from K & Company. You can tell they're older. LOL Their time has come and gone, but I really wanted to use them on these cards. Thanks for taking a peek! God bless you! 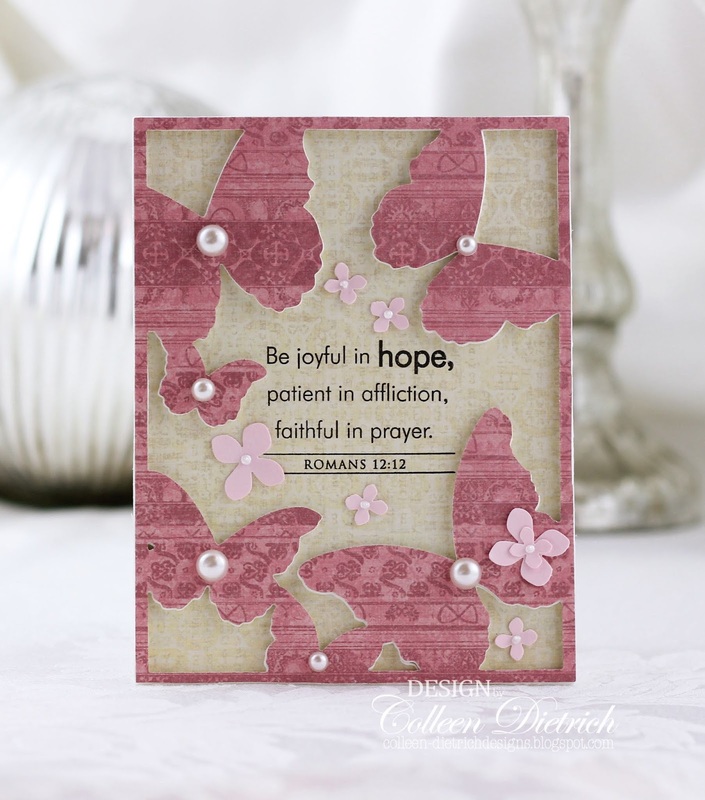 I love to make encouragement cards to let people know they're being thought of and prayed for. I've got two I'm sharing today. 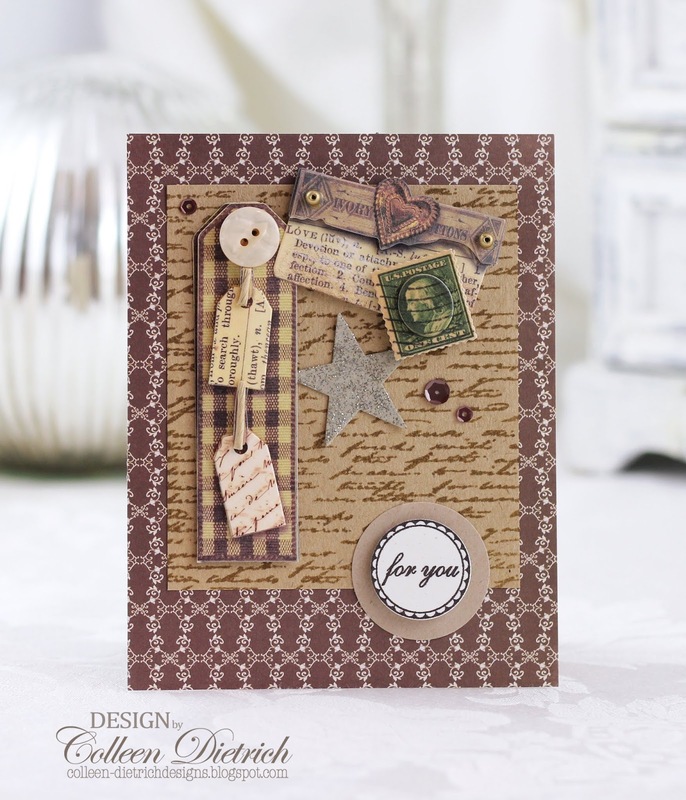 The first is super-feminine, and uses a sentiment from Power Poppy 'Olive and Oak Expanded' clear stamp set. I stamped it onto an oval die cut, which had been shaded (before stamping the words) with Antique Linen Distress Ink while it was still in the metal die. The paper is from DCWV Nana's Nursery: Girl, and I used a bit of crochet lace and a paper gardenia from iamroses.com. The card was just a little something to let them know that we wished there was more we could to help but that we were thinking of them and praying for them. Thanks so much for your visit today. Hope your day is beautiful! God bless you! Hello there! I realized as I sit at the computer to share these cards, each one involves scraps from the Stampin' Up! scrap bags I buy from my friend. What I love about using the goodies I find in those bags is the special challenge it gives me. Not knowing what my friend's projects looked like (for her SU stamping club), I have to pull together my supplies and come up with something worthy to finish them. 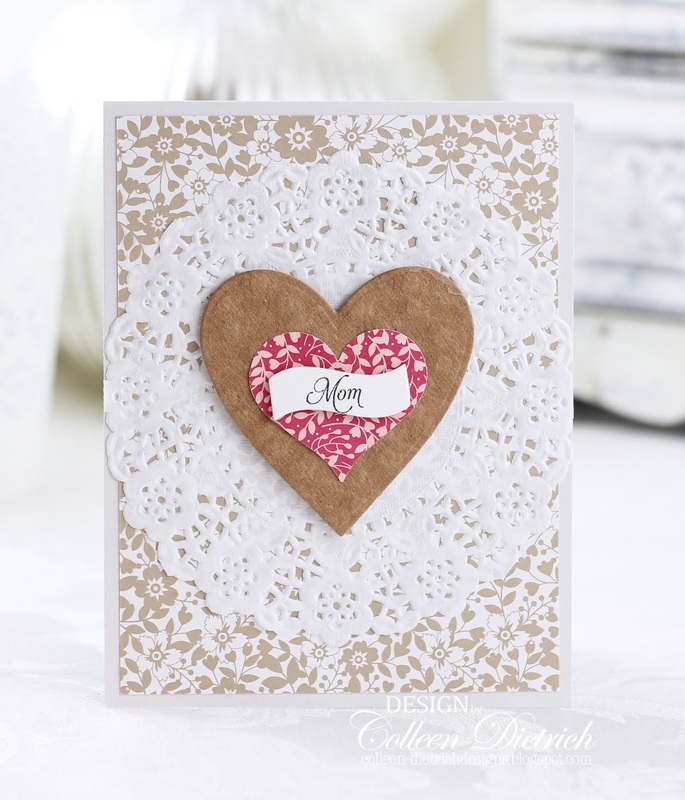 The first card was SUPER easy, because the whole focal panel was already stamped for me! 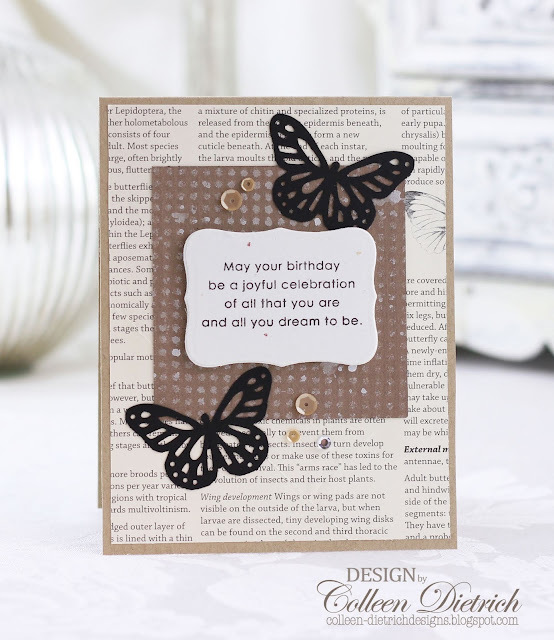 I mounted it on a pale gray card base, with an orange panel and gold mirror cardstock strip. The next card was a little more challenging for me. 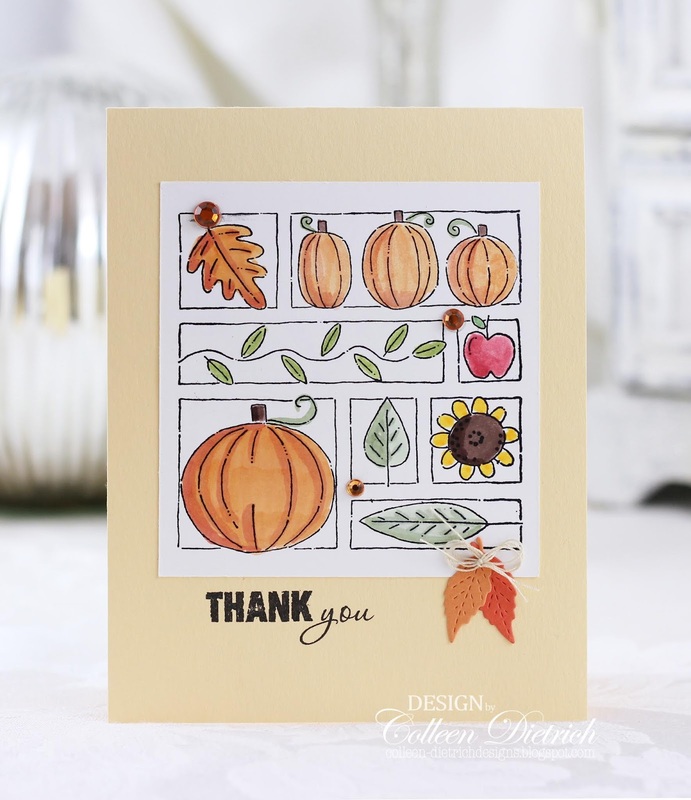 This white panel had bright yellow and coral inks (and a tiny bit of blue) sponged onto it and a navy branch with berries stamped in one corner. I started by matching up some Groovy Guava die-cut flowers and decided to go with Tempting Turquoise or Taken With Teal (can't remember) as a coordinating color. 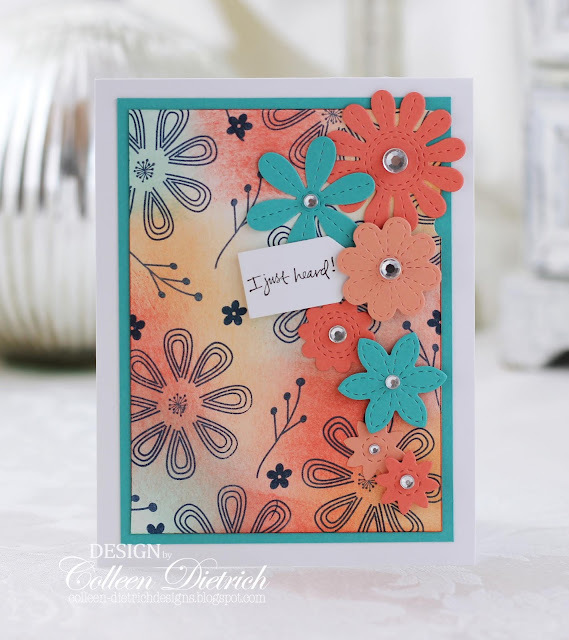 I layered on the flowers, alternating colors and heights. 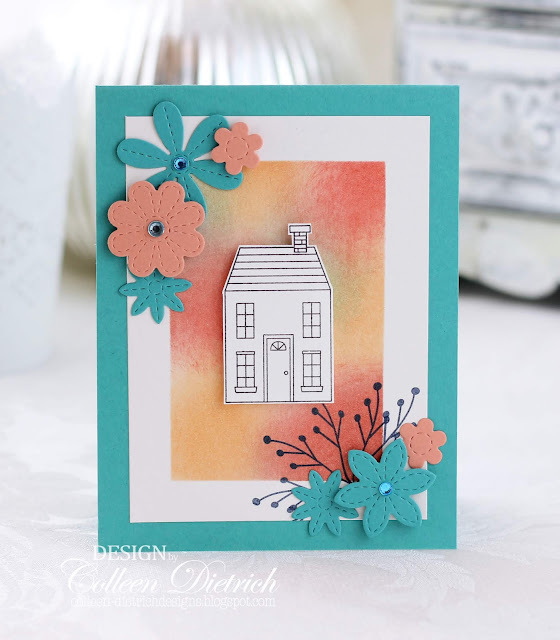 The house was stamped, trimmed and left in a black and white state to draw attention to it amidst the riot of color. 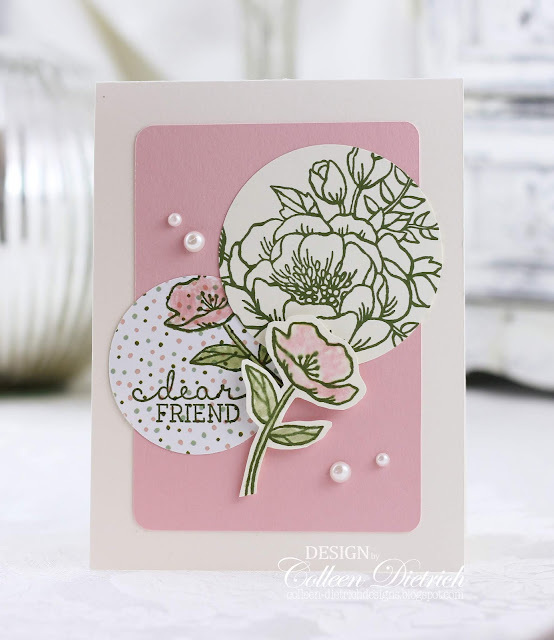 As you can see by the next card, there must have been a few projects going on at my friend's stamp club that involved these colors! 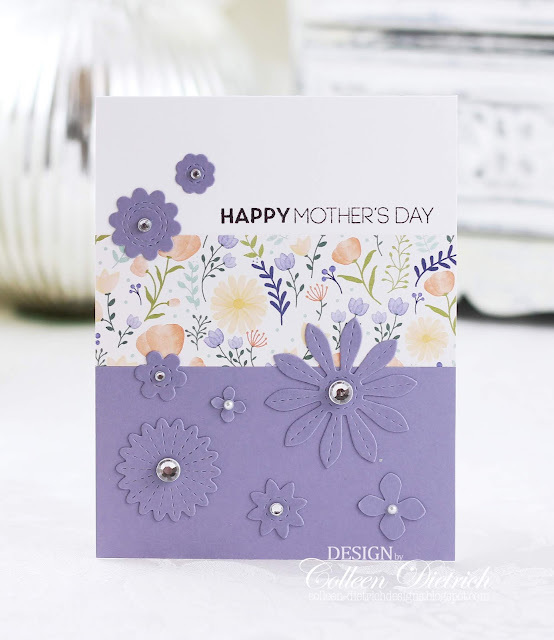 The stamped panel came as-is, so I added the die -cut flowers, rhinestones, and tag with sentiment for a 'Congratulations' card. 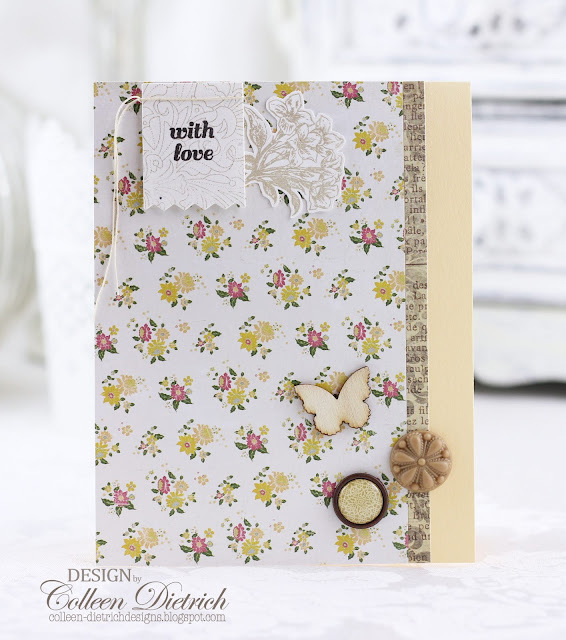 The last card began with a panel of gold/cream patterned paper, which for some reason reminds me of The Flintstones t.v. show I watched as a kid. LOL It had a square stitched frame opening, but it was not cut straight (which is probably why it was in the scrap bag! 😄). I didn't want to waste any of the gold paper but cutting it down further, so I looked for a way to disguise the wonky opening. 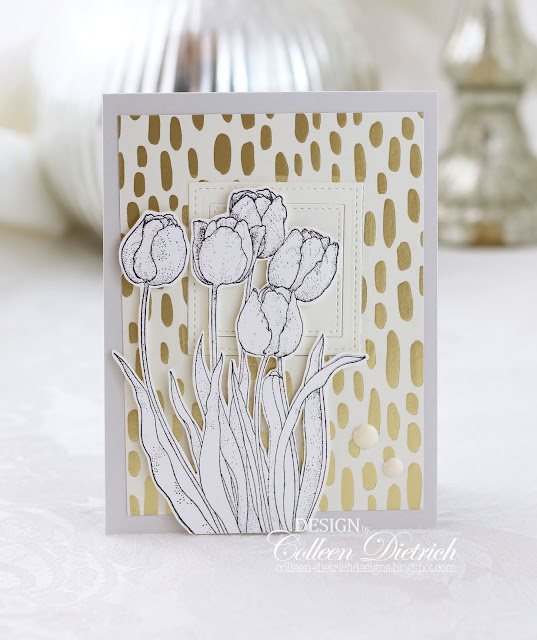 I added the other piece of cream stitched square die cut center, putting it back in place basically, and then topped it with a garden of tulips that I stamped and hand-cut. My hope is that they camouflage that opening. I also put two ivory enamel dots near the bottom to draw the eye away from the center. Blockhead Paper Arts 'Flower Garden' - gold/cream patterned paper from Stampin' Up! Thanks so much for your visit, and God bless you! Have a wonderful day! Hello! 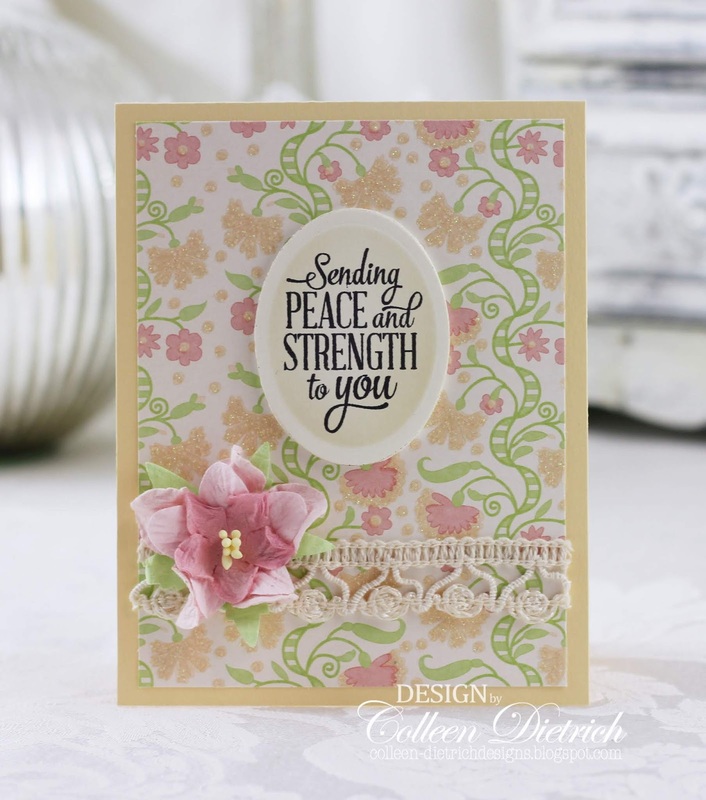 Papertrey Ink makes a set that I have just fallen in love with, called 'Walk By Faith'. The font looks like actual handwriting and the set has some terrific sentiments. 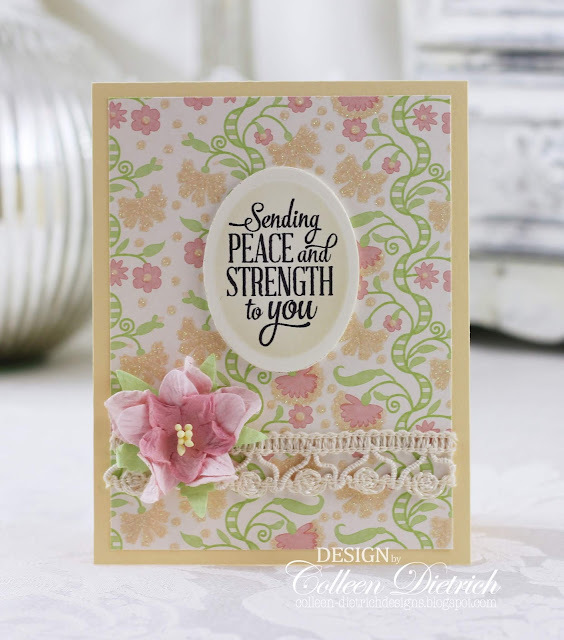 This one, 'Be strong and courageous', is so powerful! 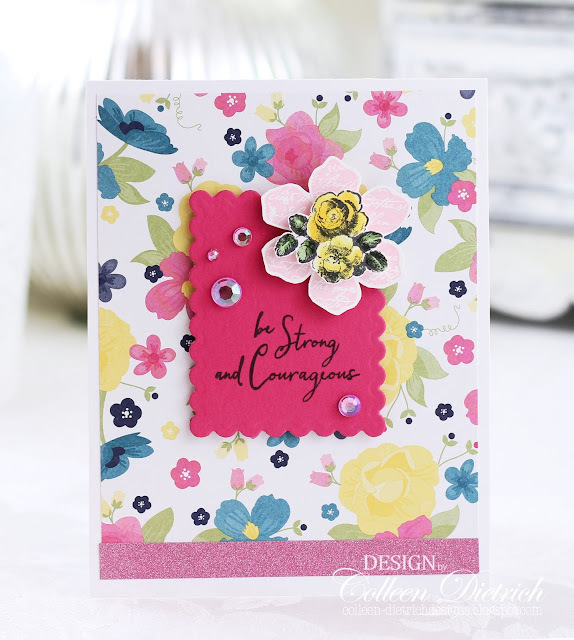 I thought it needed to pair with deep pink, and an explosion of flowers. 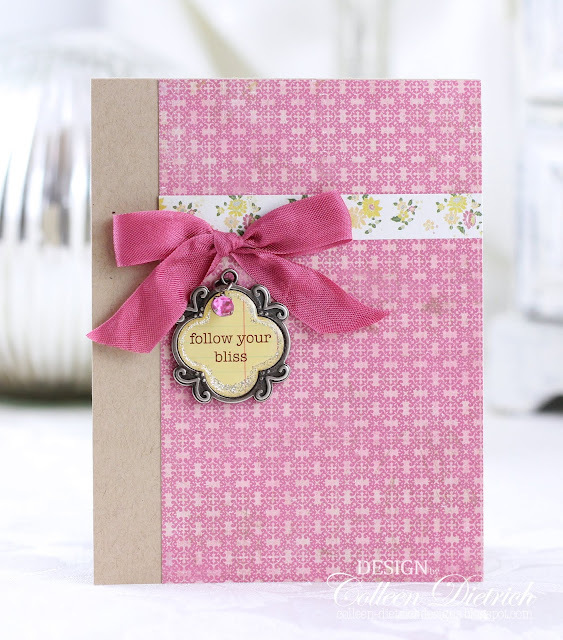 There's even a strip of bright pink glitter paper at the bottom. The yellow flowers have a more nostalgic, old fashioned feel to them. They are roses from Anna Griffin, which I hand-trimmed to go atop a pale pink, more modern flower from Stampin' Up! 's 'Vintage Vogue' set. Thanks so much for your visit, God bless you! Hello there! I've been on a kick, grouping cards by theme. 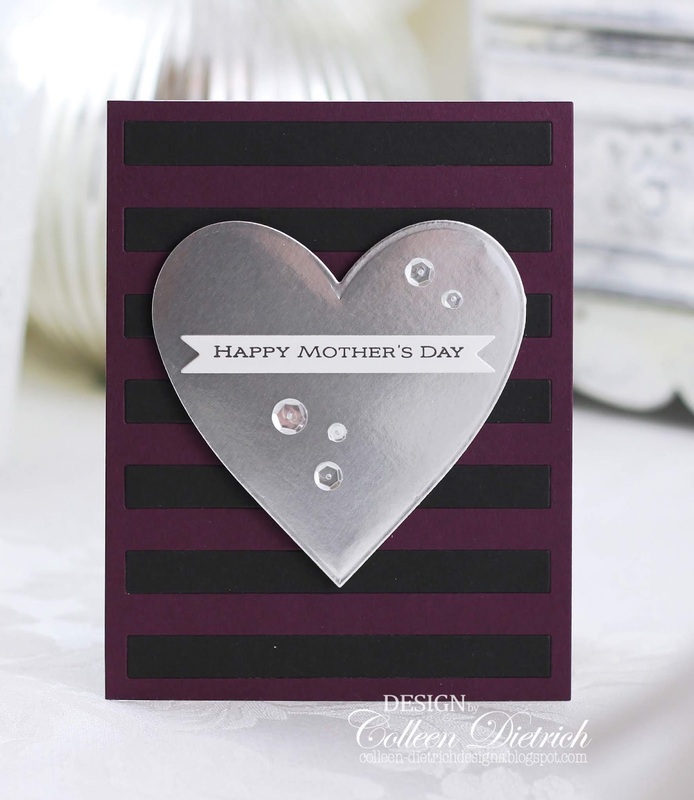 I happened to notice that most of the cards here in this post have a circle as the main focus (with the exception of the second card, which falls under the Easter category). 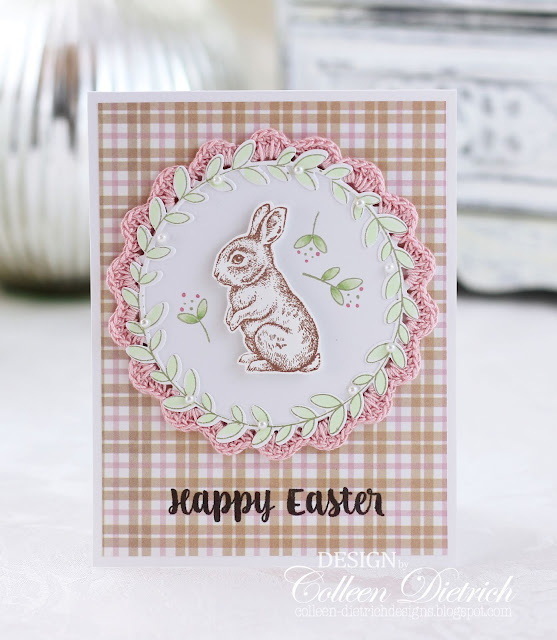 I framed a sweet little bunny with a stamped wreath (supplies listed in photo caption), and placed a beautiful pink crocheted circle behind it. My friend, Jessi Fogan, crocheted this, and she sent me a few of them years ago. 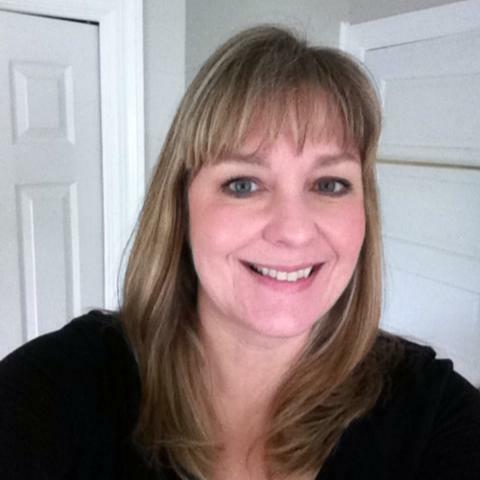 Unfortunately, I just found out that Jessi passed away from a severe illness. 😢 It makes me treasure these little crocheted circles all the more . What a beautiful reminder of a funny, generous lady. This cross is from Unity Stamps, from a set called "Praise The Lord." 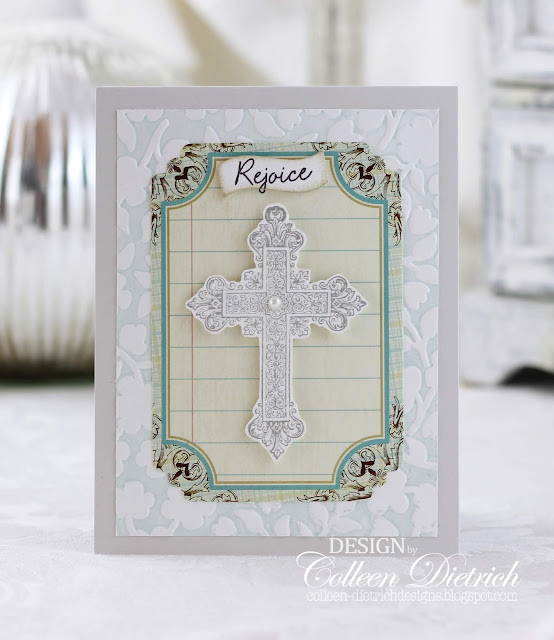 I love the intricate detail, which may be hard to see in the photo since I stamped it in light gray. It's exquisite. I paired it with a 'rejoice' sentiment from Wplus9. 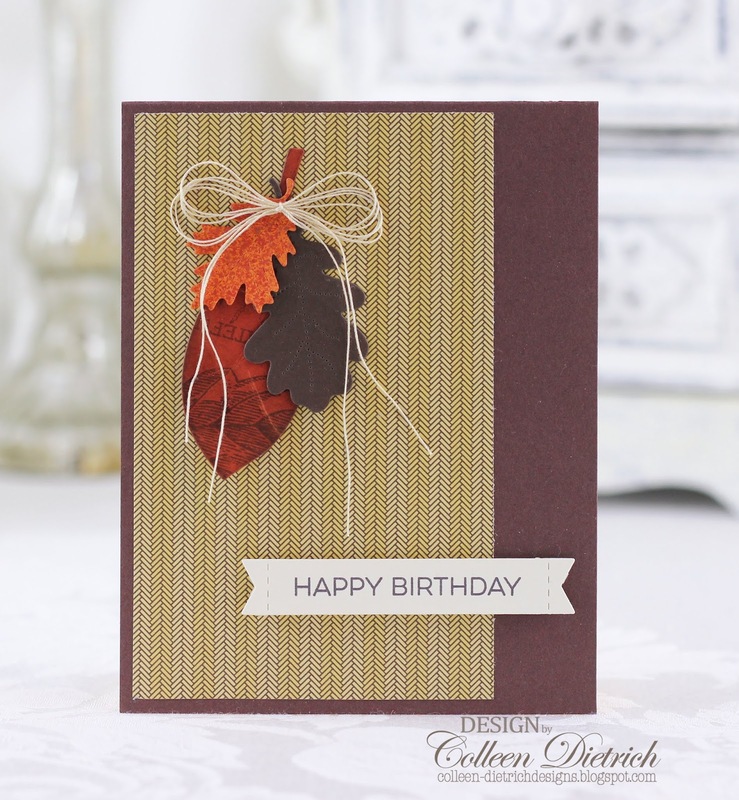 The masculine card below was a thank-you for my husband's cousin, who is a woodworker. He made us a really cool Christmas card/ornament/frame (hard to explain it, and I didn't take a picture) for 2018. He loves handmade things, and even asked his mom to make him a quilt for his bed. 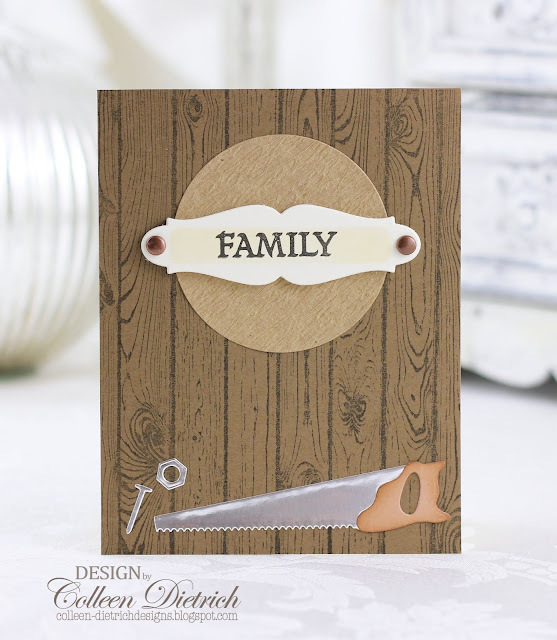 😊 So, I made him a card that reflects his love of woodworking, and reminds him that we are family. 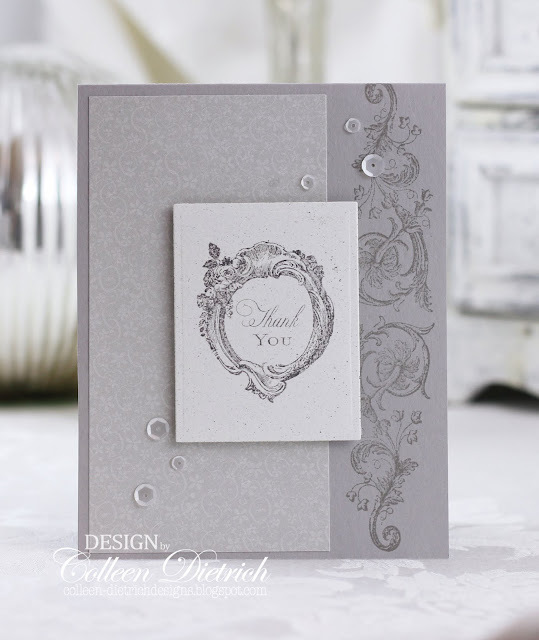 The Papertrey Ink 'Rustic Wreath' die shows up again on this last card, this time in brushed silver cardstock. It's a super simple thank you card, topped with just two rhinestones and a big 'thank you' stamped sentiment. Thanks so much for taking a look at the cards today! I am grateful for the comments that you all have been leaving here on the blog. You're so kind! 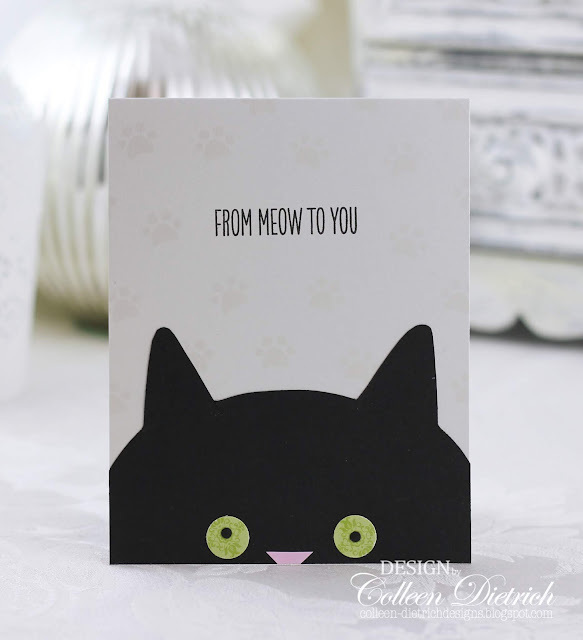 LOL - the kitty cards I'm showing you today were SO fun to make! There's a black cat version and a pale gray cat version. In between, there's a 'love / happy' card. You'll see. 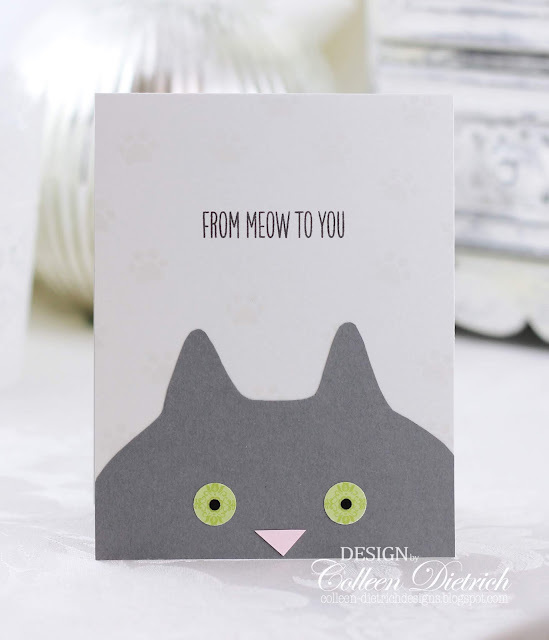 On both cat cards, I stamped paw prints randomly on the card base in a pale ink, and then used black (or gray) cardstock to hand-trim a cat head. The eyes are made with two different sized circle punches, and the nose is just a tiny triangle of pink cardstock. Cuties! 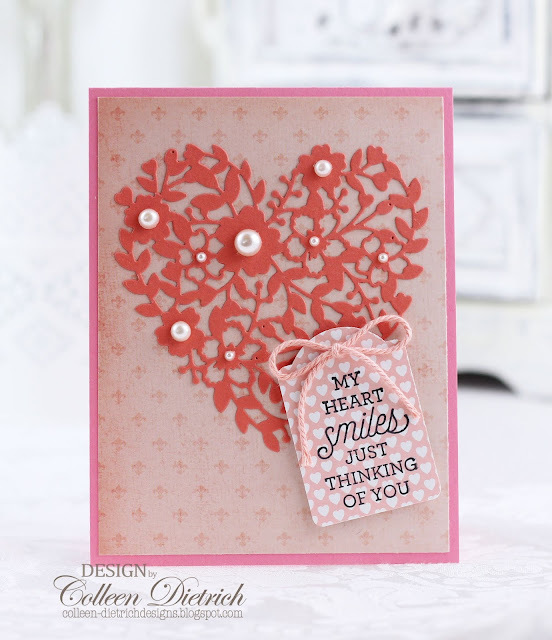 Love the woodgrain (I forget which paper pad this came from) and silver mirrored heart on this next card! I added a sentiment from My Favorite Things 'Essential Sentiments' on a double ended fishtail banner, and dark smoky gray and silver sequins. Super simple in design. 😀 These faces make me smile! Hello there! 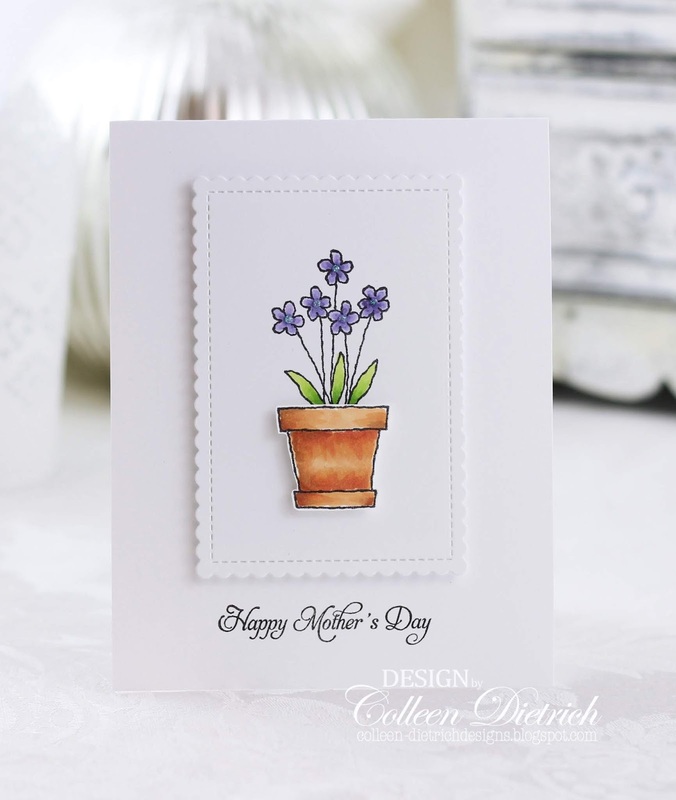 Today I've got a group of Mother's Day cards to share. I put my personal favorite up first. 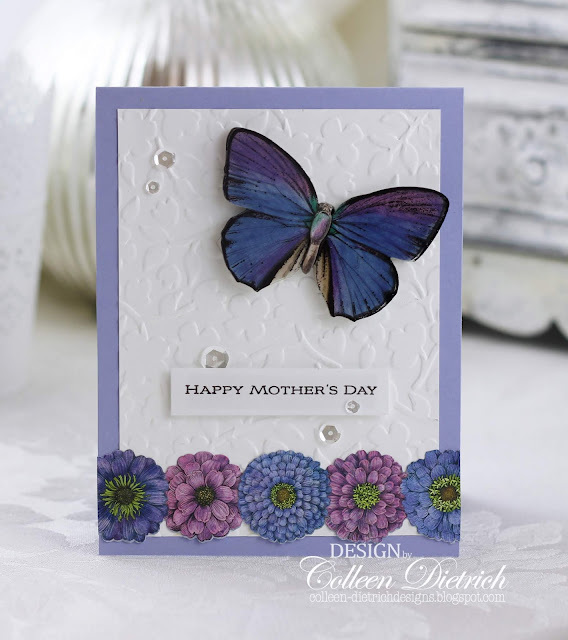 Love that periwinkle card base that brings out the beauty of the intensely colored butterfly sticker. Lots of flowers appearing here! When I think of Mother's Day cards, I do tend to lean toward the botanicals. I went off the beaten path, though, for that one card with the deep raspberry and black stripes and a silver heart. I was going for a modern touch, but I'm not digging it with all my heart (pun intended). Thanks so much for taking a peek and God bless you, have a terrific weekend! Popping in with a few cards!